So you’ve got one more week to view my solo show over at the Axiom Center for New and Experimental Media (through November 6). The centerpiece of the exhibition is my 6-channel, real-time, algorithmic sound installation Kaleidoscope Music, the history, aesthetics, and inner workings of which are amply documented elsewhere (Dig Boston feature, Artforum critic’s pick, Kickstarter project, and several exhaustive blog posts, for starters). Rather, what I’m here to tell you about today are the prints from my 29 Giraffes series that are also included in the show. I usually do a pretty good job of documenting my pieces when they go up, but I never got around to blogging about this series when it was first exhibited at [the studio] in Shanghai, back in August 2009 (check out the press release, flyer, and this fine review from That’s Shanghai magazine). So allow me to take a few moments to fill you in. 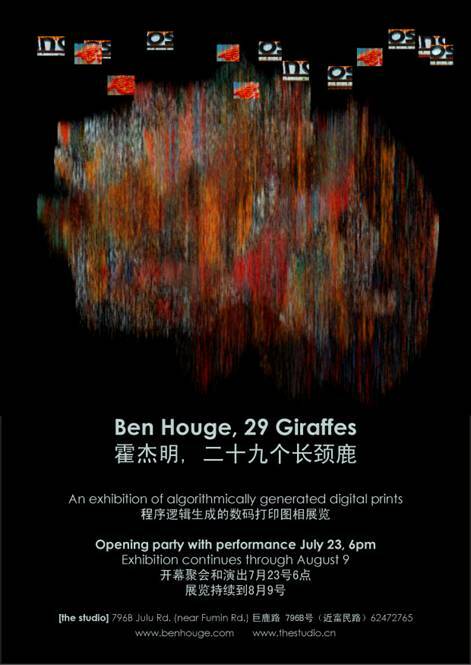 29 Giraffes represents my first foray into visual art. The earliest source file I could find dates from July 29, 2007. You can see some of the images on Flickr and additional images (including some early tests) on Facebook. These images were a natural extension of my work in sound, and the original goal was simply to create an album cover for my CD Radiospace 040823 (as featured last night on Gregory Taylor’s radio program Remember Those Quiet Evenings!). That piece performs algorithmically modulated granular synthesis on a live radio signal, sort of sandblasting the sound into new patterns and textures. I got the idea in my head that the album art ought to be generated the same way, and this stubborn notion delayed the release of the album (recorded in 2004) by about five years. It took a while to conceive of how to translate the process into the visual domain, and then another long while before I realized I could use software I already knew (Max/MSP, specifically the lcd object, before I learned Jitter) to pull it off, and then an extended period of experimentation and testing before I felt the results were worth sharing with anyone. After all that effort, I kind of hate the image I rather hastily chose for an album cover, but I was in a hurry to get the CD pressed in time for the exhibition opening. If I had waited a little longer, this is the image I would have used (and still hope to use for a reissue one of these days). 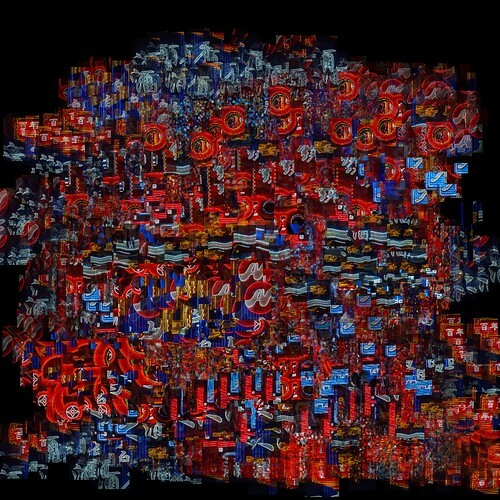 In the same way that Radiospace samples bits of radio, these images sample fragments of digital photographs. The final images manipulate images of neon lights from Shanghai’s Nanjing Dong Lu pedestrian corridor (the stretch of street where the Sofitel in which I recorded Radiospace 040823 is located), not too far from the Bund (taken on a photo shoot with Jutta for my birthday in 2007, four years and one day ago). The software excises little chunks from these images and statistically arranges them into new patterns, according to various parameters that I can set (min/max size of the image fragment, location in the original image, density, opacity, etc.). The final compositions are comprised of one or more layers (sometimes quite a few) of these statistical passes (horizontal or vertical), which I think of as analogous to brushstrokes, over the black digital canvas. The boundaries of these digital brushstrokes into which fragments of photographs are statistically pasted are derived from curves I’ve drawn by hand into tables with a mouse. My earliest studies involved Gaussian patterns and other types of statistical distributions, but I eventually decided I wanted to incorporate a more tactile, hand-drawn element. I felt at the time the need to emphasize that these works weren’t simply the cold, rational, impersonal result of a some obscure mathematical formula. Rather, I was involved in an intuitive and iterative process with my software, guiding the generation of new material, and then responding to it to see if I liked it or not, shaping its evolution much as I imagine an artist in a more traditional medium would. The final images have nothing to do with giraffes. When I started developing software to manipulate digital images, my earliest test subject was a photo of a giraffe I took while visiting my parents in Kenya in 2005. I started using the term “giraffe” as shorthand for the whole project, since it was quicker to explain to my Ubisoft coworkers that I was staying in over the lunch hour to work on my “giraffes,” rather than my “algorithmic image manipulation software” or whatever. There aren’t 29 of them either; the number was chosen as arbitrarily as the name, and I kept both to emphasize the idea that arbitrariness (or artistic intuition) is a key part of the piece.